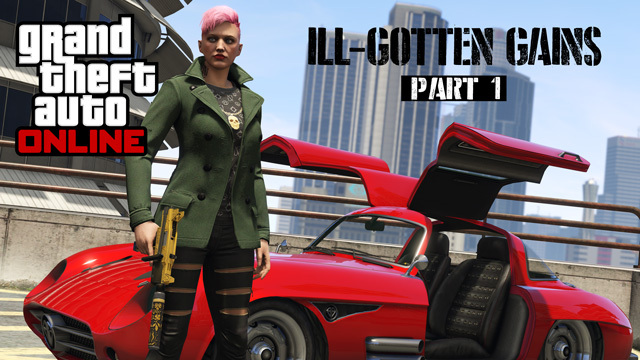 The first content update for GTA Online post-PC release is due out next week, on the theme of ill-gotten gains. The update will bring new vehicles, weapons, clothes and vehicle wraps - so you can show everyone your incredible taste - or lack thereof. Due to a surge in high-end crime across southern San Andreas, demand for luxury goods and services is at an all-time high. Upscale merchants of all kinds are scrambling to fill their inventories to serve the newly wealthy. The first of two major deliveries this summer will be hitting the showrooms of luxury car dealerships, the shelves of top arms suppliers and other prestigious retailers in June. Here are a few new screenshots featuring some of the new rides and accessories coming to GTA Online next week � and be on the lookout for another big shipment coming this summer. Cars:�Enus Windsor, Albany Virgo, Benefactor Stirling GT, Pegassi Osiris - the latter two both featuring gull-wing doors. Aircraft: solid gold�Buckingham Swift Deluxe,�solid gold Buckingham Luxor Deluxe. Clothing/Accessories: "hundreds" of new items, in addition to 8 vehicle wraps. You can see some new HD screenshots of some of these new things over on the Newswire.